My original intension when I selected the crater Copernicus was to have the terminator line very close to it. I didn’t get my timing right by a long shot! Instead, it was closer to a Lunar mid-day, making the shadows very short. I was hesitant to sketch it, having my expectations dashed, and took an hour before I decided “What the heck! Just do it”. Conditions were quite good for Sydney. At the best of times, using 222X is barely useable, giving only fleeting moments of clarity. This night was more good than poor! And an added bonus, NO DEW! This is the first time I’ve used charcoal and soft pastels to do such a finely detailed sketch. It took a little getting used to, but what I really like about this materials is you can build up the layers to achieve the result you want. I found them very forgiving, unlike the cold. Two hours, a pot of tea to keep the cold at bay, and a gorgeous orange tube C8, and this is the result. Media: Black & white charcoal pencils, grey soft pastel pencil, and white ink on black paper, A5 size. 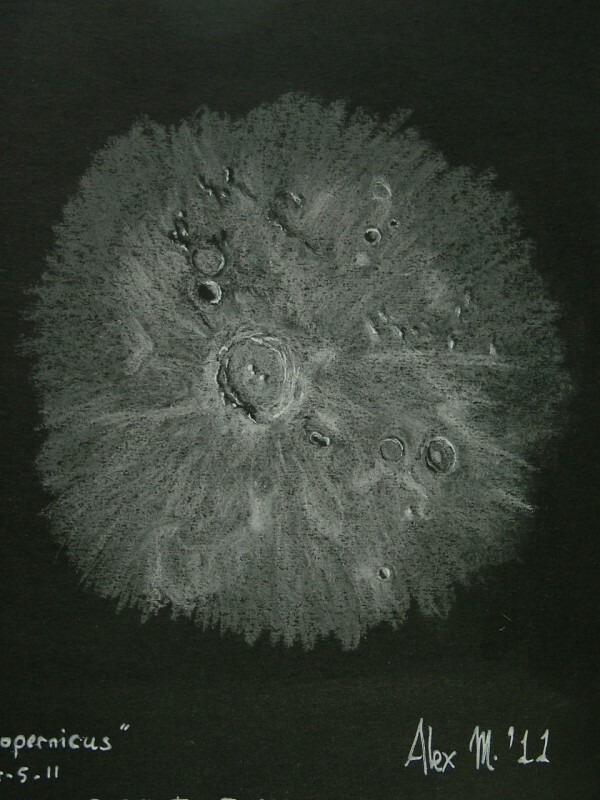 This is a stunning capture of Copernicus made all the more special being your first use of charcoal in the cold. Hope to see many more.